The 1920s saw a boom in the building industry largely in part due to the new ways that materials could be mass produced. 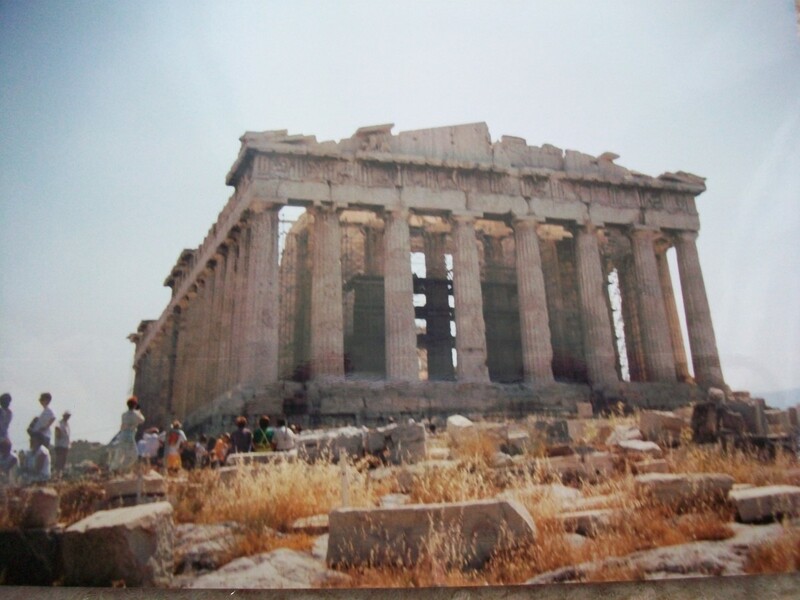 This coupled with a booming economy gave way to some of the most popular building periods of all-time. Styles of this period are eclectic, taking elements of modern design and classical design to form new and interesting facades. Art Deco Style is a product of the machine age that combined traditional elements with a very symmetrical and stream-lined design. The Art Deco Style evokes elegance and luxury. 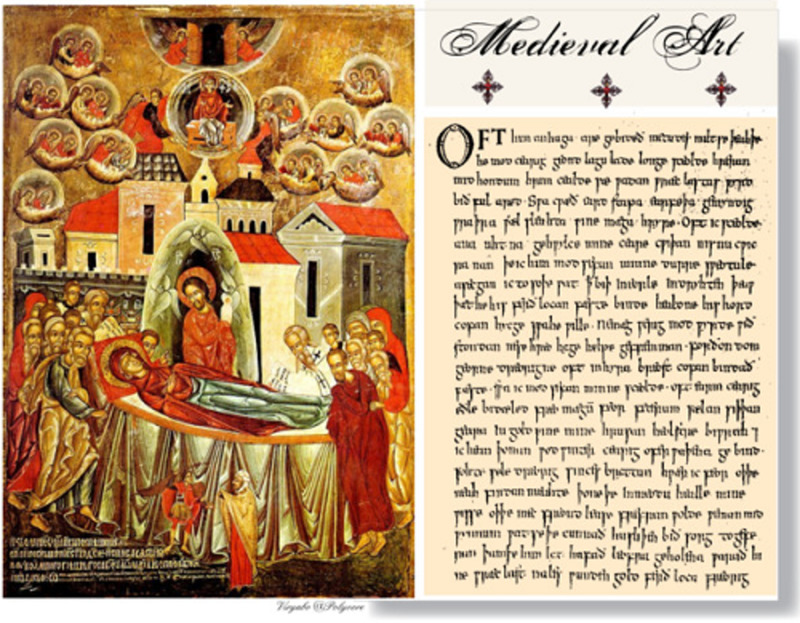 Neo-Gothic, also called Gothic Revival came about because the new generation of artists wanted to revive the medieval architecture elements of European buildings. These buildings feature decorative finials, patterns, scalloping and moldings with heavily arched windows. Beaux-Arts was a movement (and an exclusive art school) featuring Neo-classical French and Italian designs heavily inspired from designs of the Renaissance, Baroque and Rococo periods. Prairie Style is a quintessential Midwestern U.S. design style not found anywhere else at the time and not influenced by any European architecture. The concept was to mimic the natural landscape of the Midwestern prairie and buildings reflected that by employing horizontal lines, hipped roofs and overhanging eaves. 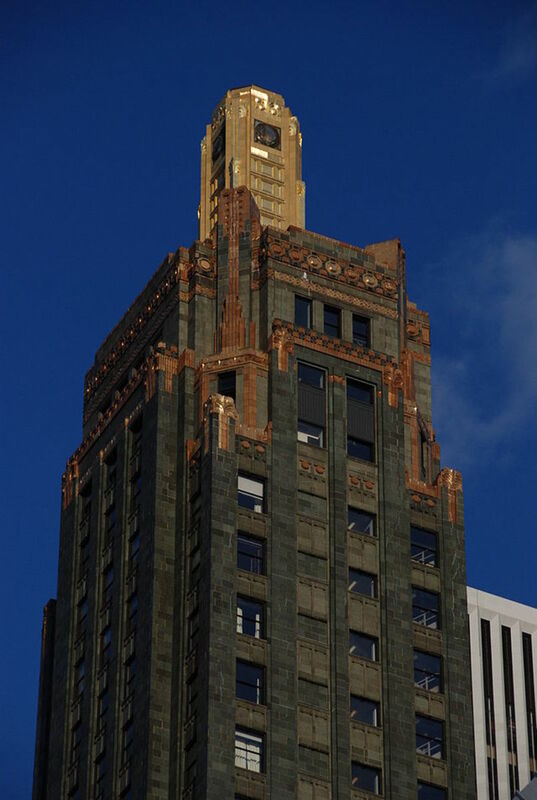 Sons of the famous city planner, Daniel Burnham, Hubert and Daniel Jr. designed this classic Art-Deco style building with polished black granite and green terra cotta exterior with gold-leafed accents. The art-deco ornamentation has some beaux-arts touches because the sons had studied in Paris in classical styles of Greek, Italian and French designs. 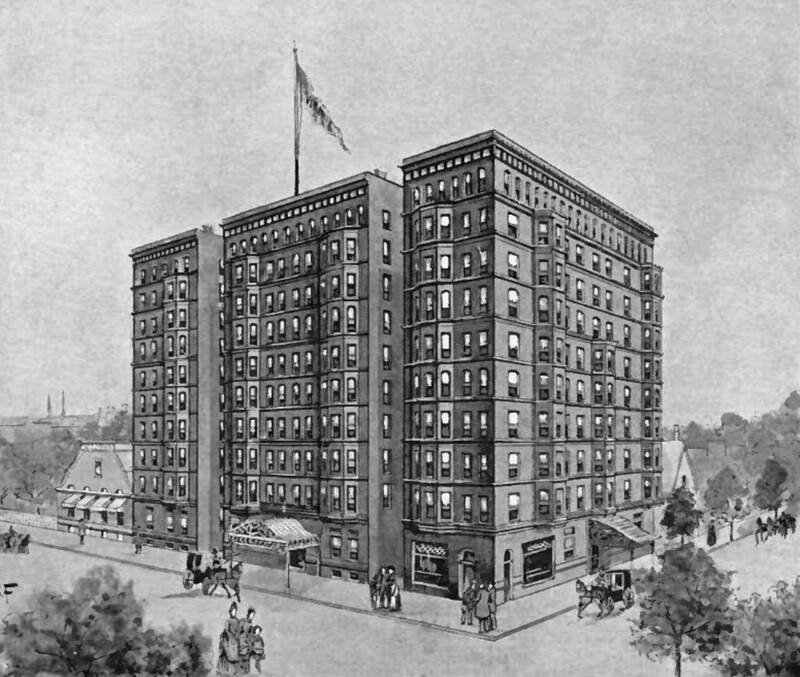 Their father thought it was important for his sons to be able to have a good education, probably because Daniel Burnham Sr. wasn't able to have that type of education growing up. Rumor has it the inspiration for this design was found on a green and gold leafed champagne bottle at a holiday party they attended. 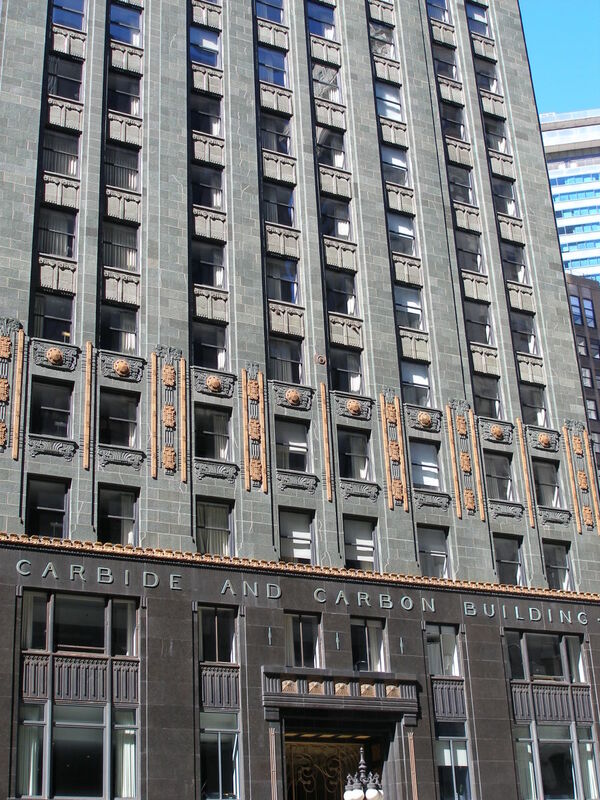 Originally built for the Carbide and Carbon company (most of these famous buildings were built for specific companies), the building currently houses a hotel. The historical significance of where the bridge is located is commemorated in the sculptures and plaques located on the bridge houses. The North end of the bridge sits on an area that was once the Jean Baptiste Point du Sable home site. DuSable was the first, non-native permanent settler in Chicago (about 1780's). He was a fur trader who built his home and trading post just north of the Chicago River. The Discoverers: Louis Joliet, Jaques Marquette, Rene Robert-Cavelier, Seur de la Salle and Henri de Tonti. The Pioneers: John Kinzie leads a group through the wilderness. Defense: A scene depicting the 1812 battle at Ft. Dearborn. Regeneration: A scene depicting workers rebuilding the city after the Great Chicago Fire of 1871. Have you ever gone on an Architectural tour? 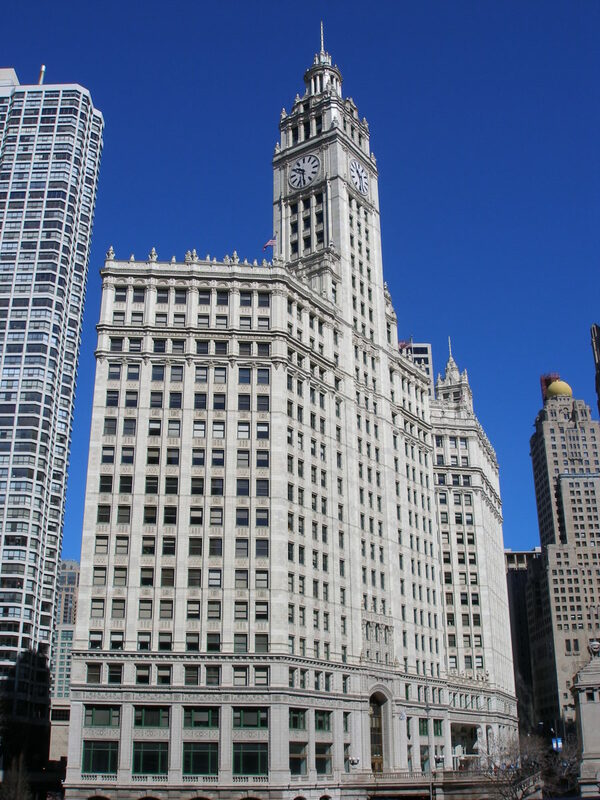 Sitting just north of the Chicago River at Michigan Avenue, the Wrigley building was originally built to house the corporate headquarters of the Wrigley Chewing Gum Co. This famous Chicago building has a gleaming white terra cotta façade that glows when it is lit up at night. The French renaissance design details are modeled after the Girlada Tower of Seville's Cathedral. 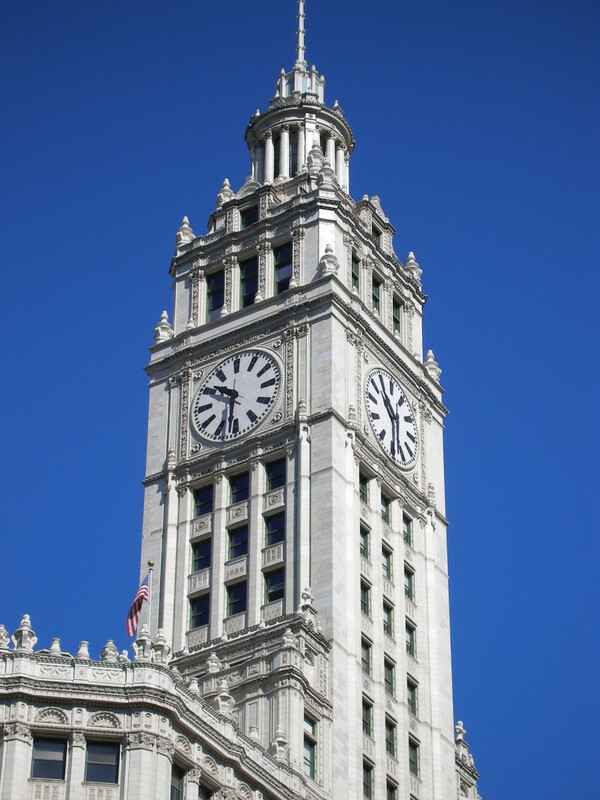 The Wrigley building is actually two towers, connected by a ped-way. The South tower is 30 stories high and the North tower is 21 stories high. 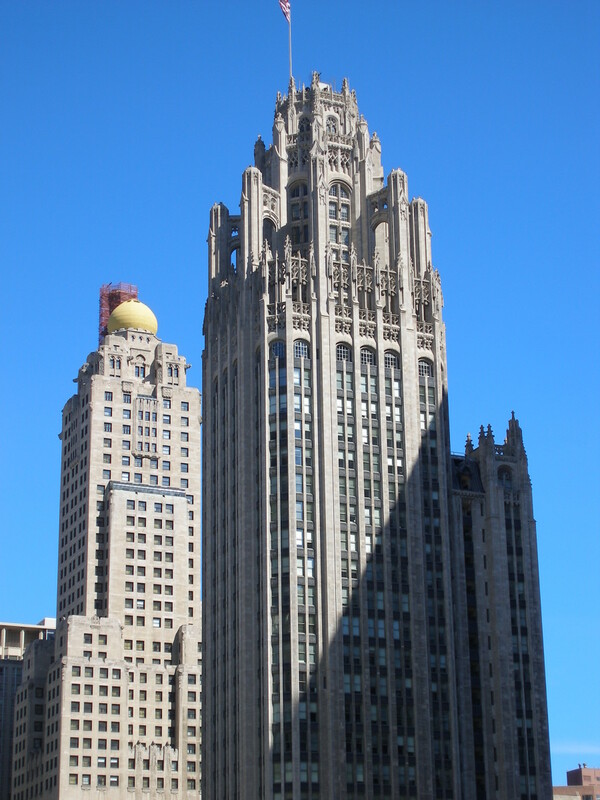 In 1922, the Tribune Broadcasting Company hosted a design competition for their new headquarters. First prize was $50,000. They were looking for the most beautiful and distinctive building in the world. This Neo-gothic styled building by Howells and Hood won the contest, featuring ornate flying buttresses and a French gothic inspired façade. 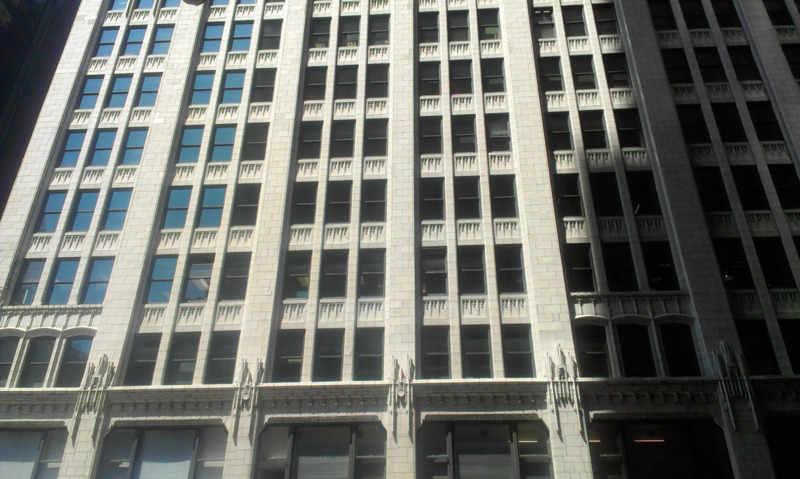 Built for the Mather Stock Car Company (builder of rail cars designed to transport livestock), this Neo-Gothic terra cotta clad building is the most slender Chicago high rise. 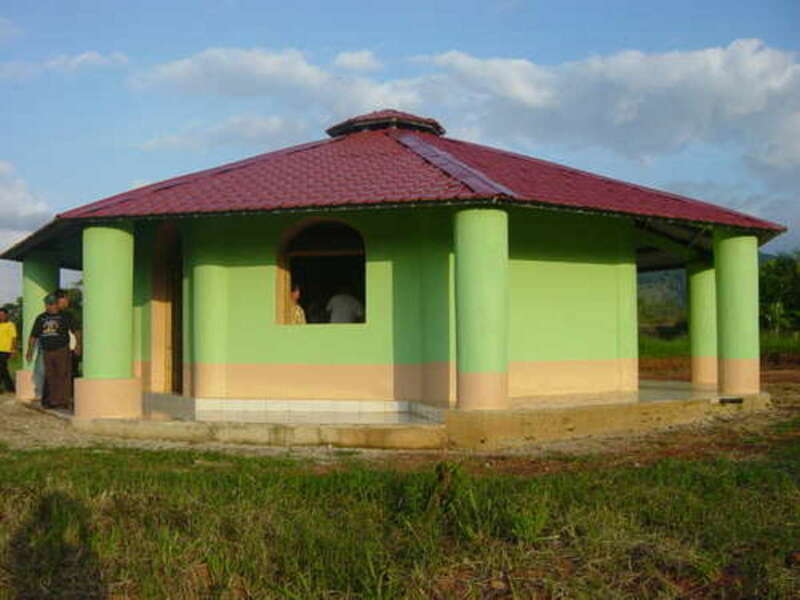 It also boasts a unique octagonal top. The building is currently a mix-use building and went through extensive renovations in the 2000s to the façade and the octagonal tower. 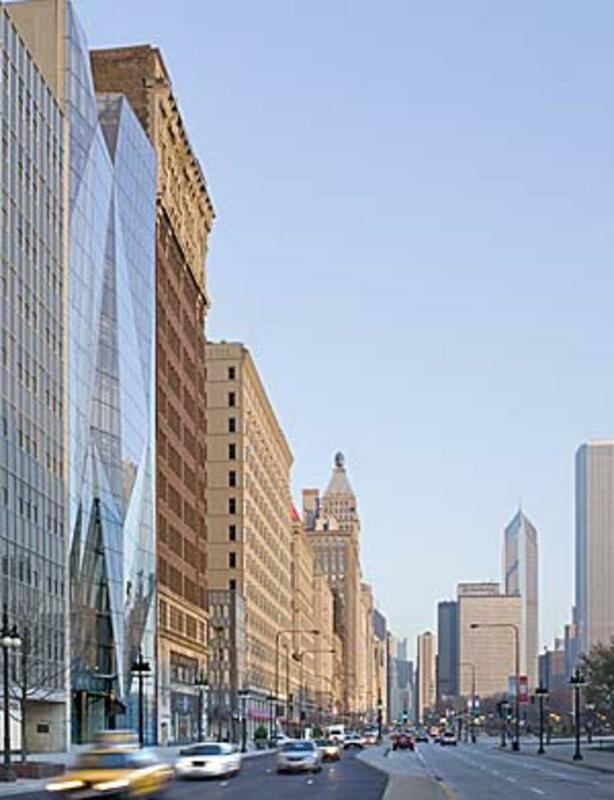 These next set of buildings are located in the financial district of the Loop. 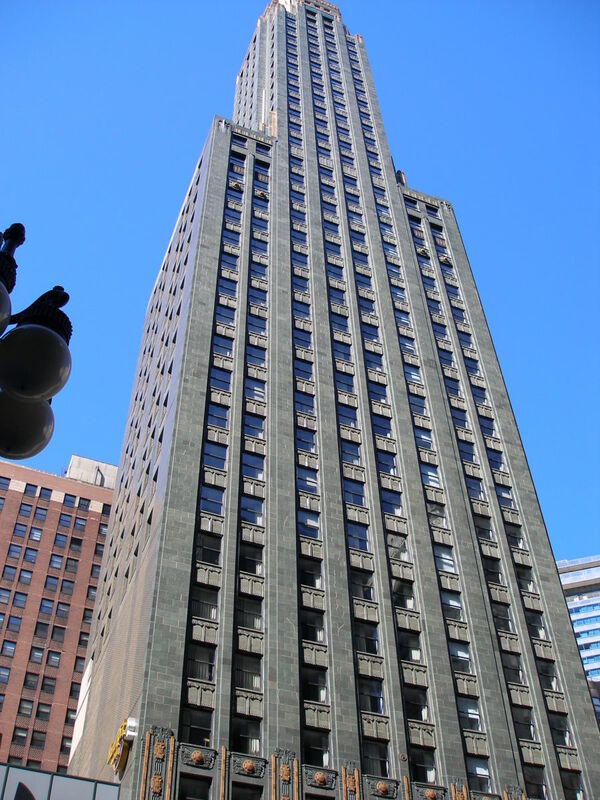 This office high rise was built by an iconic Chicago landscape architect named Jens Jensen. He is best known for his prairie style work in many of Chicago's expansive public parks, where he employed the use of native plants and trees to his landscape designs. 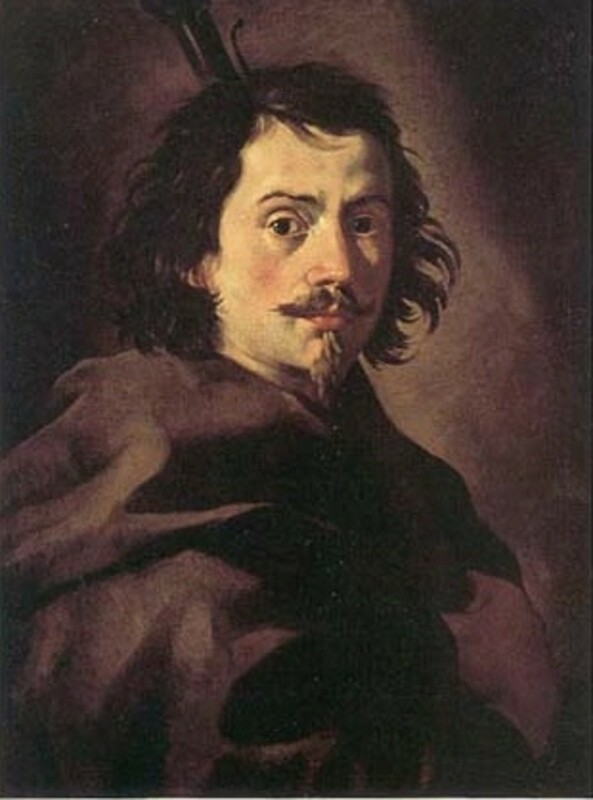 He also preached sustainability and was a major influence in fighting for the preservation of the Indiana Dunes. Across from the Sears Tower (Willis Tower as it is now called) is one of his buildings that is a bit of a departure from his usual works. 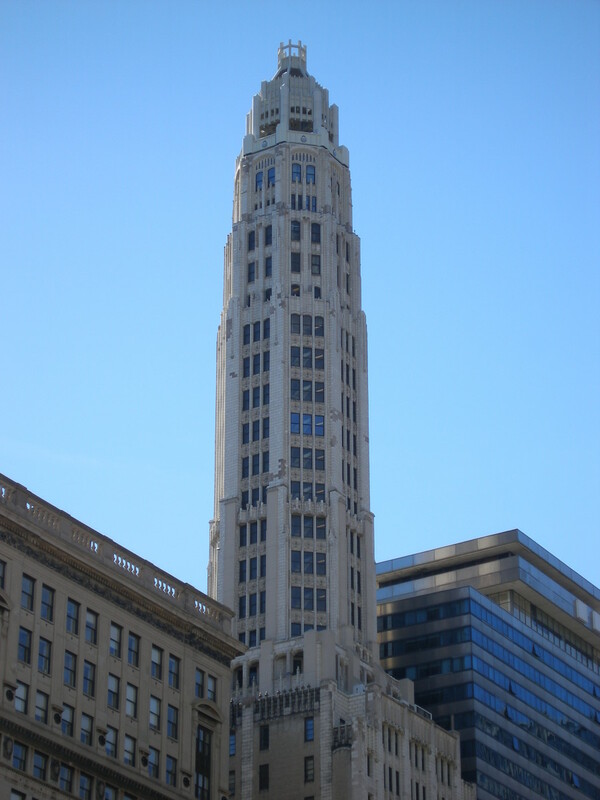 This gothic revival building is clad in white terra cotta and sits on the western point of the Chicago business district. Built in the Beaux-Arts design in limestone with Corinthian columns, this train depot replaced an earlier structure on this site. 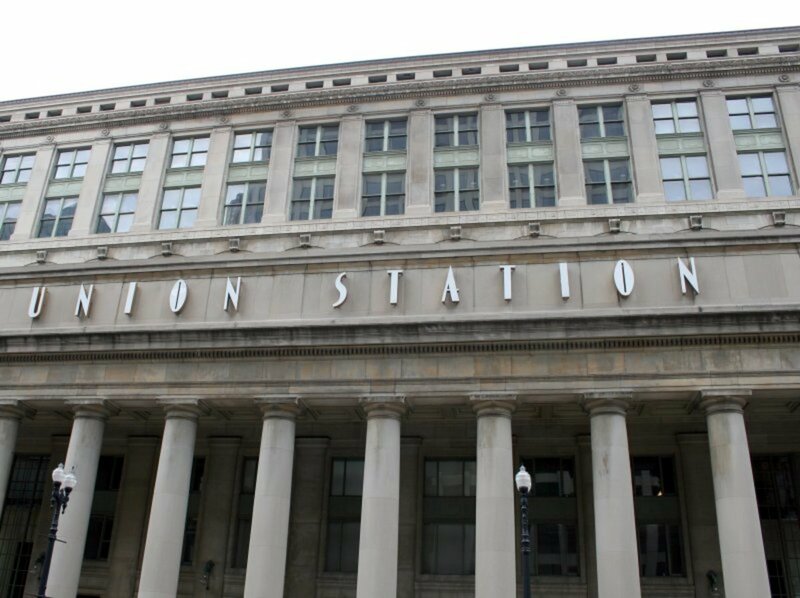 The station is home to the Metra Commuter Rail System that serves commuters traveling in from South Side and North Side locations and suburbs. It is also a major Amtrak hub. There are 10 tracks on the north side of the station that are marked in odd numbers and 14 tracks on the south side of the station marked in even numbers. No trains go through or under the station, rather there are two train tracks on either side of the structure that are bypass tracks. The interior of the structure boasts an impressive barrel-vaulted Great Hall (often used for special events) and a grand staircase. 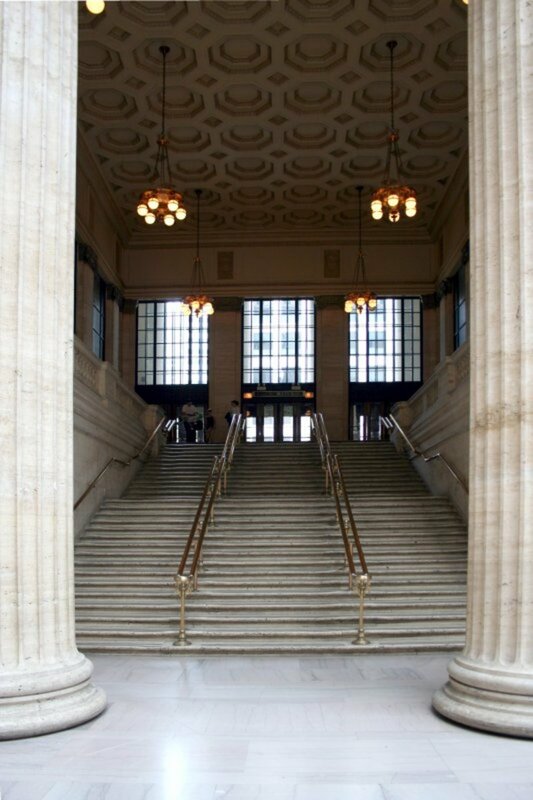 You might remember the grand staircase in the 1987 movie The Untouchables with Sean Connery and Kevin Costner. Location: 141 West Jackson Blvd. 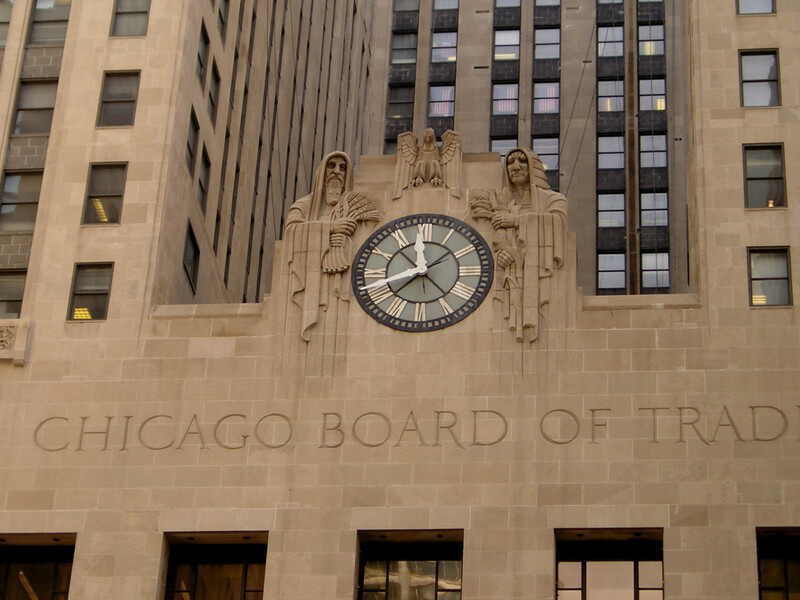 Also referred to as CBOT, this classic Art Deco style building features large stone carvings on it's façade, depicting various crops that are traded at the Board of Trade. 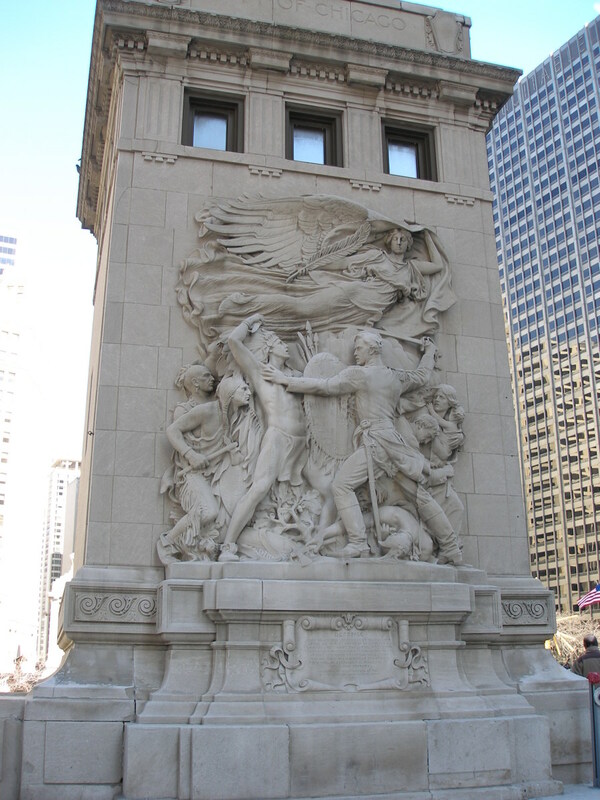 Corn and Wheat plant carvings flank it's famous clock. 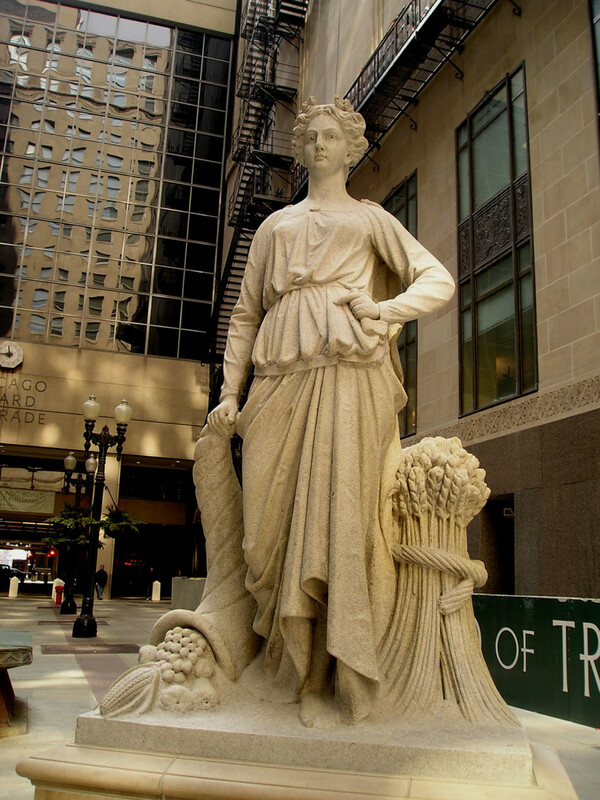 At the top of the building is a statue of the Roman goddess Ceres, the goddess of grain. The interesting thing about this statue is that it has no face. 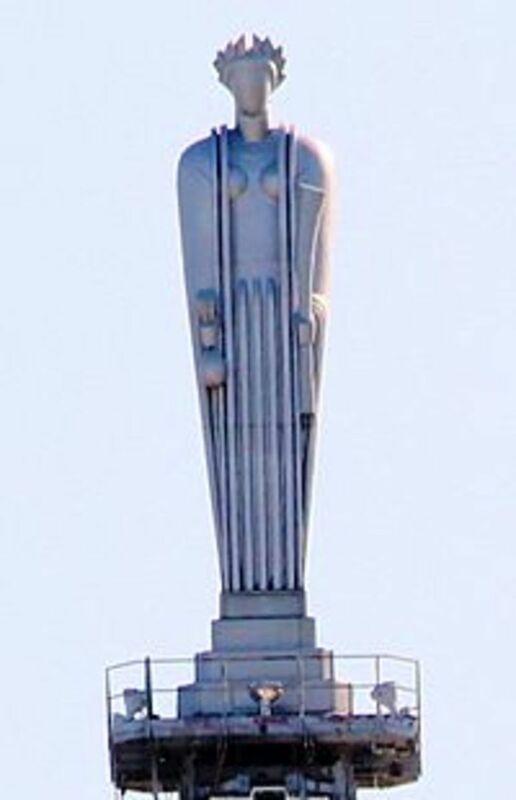 Rumor has it they decided not to put a face on this statue because buildings back then were not as tall and no one would be able to see that the statue had no face. I surmise they probably saved money by not carving out a face. This building replaced the old board of trade building that was directly built on the same spot. 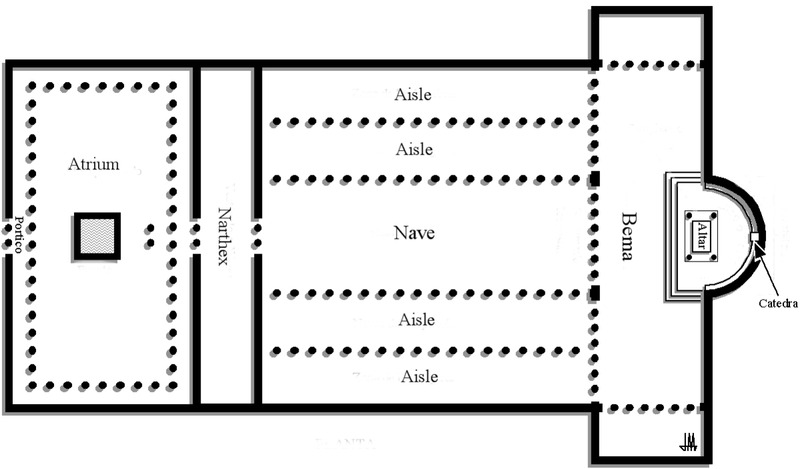 The interior of the building boasts large trading floors. 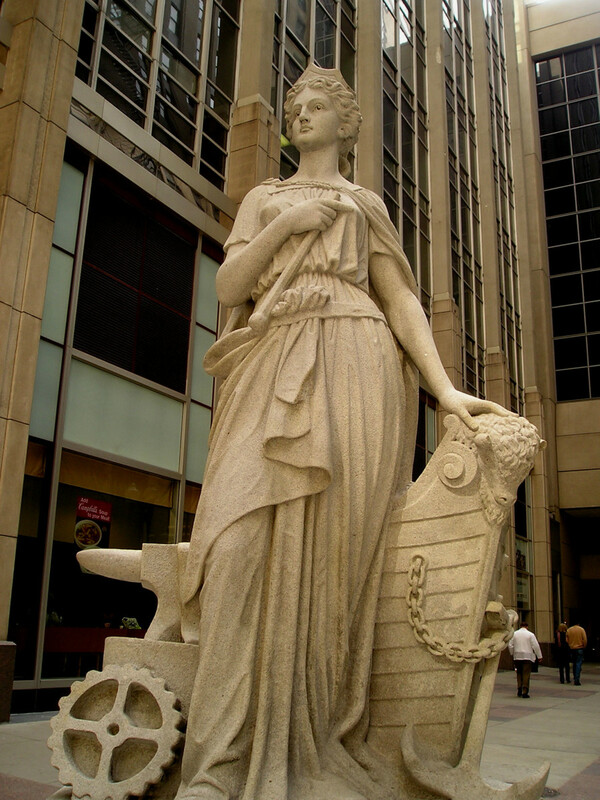 The connecting plaza at the base of the building features an Art Deco fountain with two statues flanking either side. The left statue is named Industry. The right is named Agriculture. 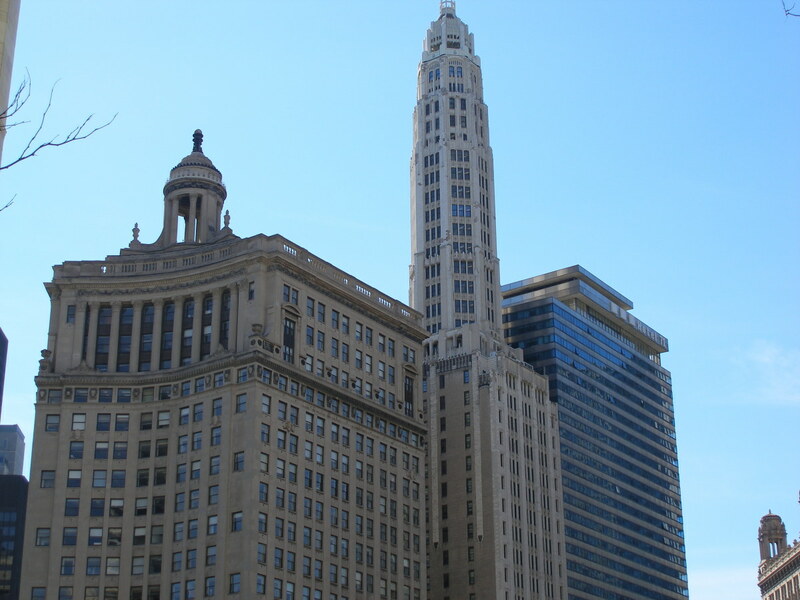 I hope you enjoyed my photographic tour of some of the most iconic Chicago buildings and that the maps help you plan out your own self-guided tour. 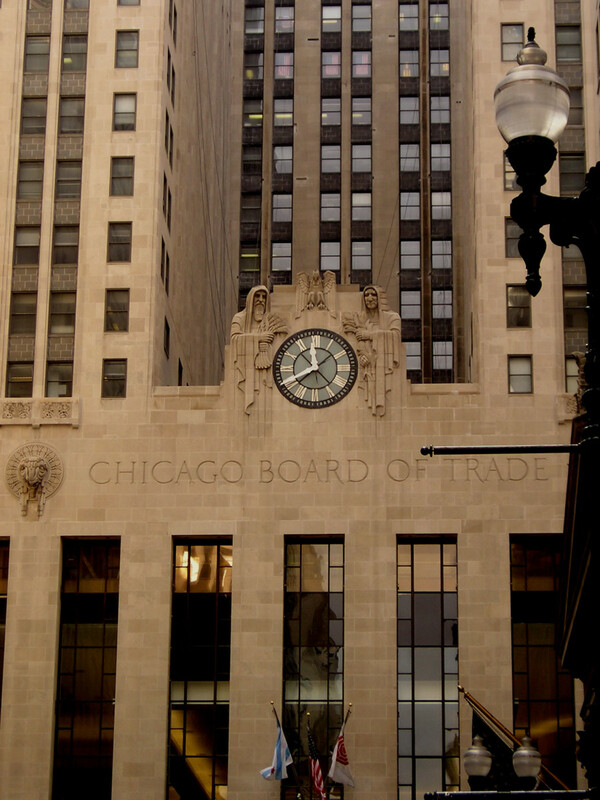 Start at either the Board of Trade and work north or start north of the Chicago River and work your way south. 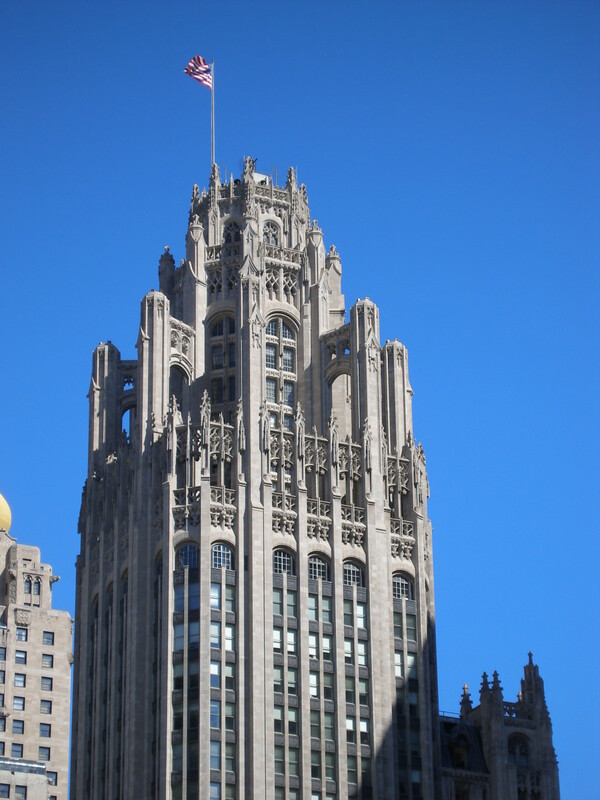 I love the look of Tribune Tower. Beautiful, detailed and very interesting!